For the last couple years I have used 2 pieces of 10 ' galvanized fence top rail for just a cheap looking mega tree. 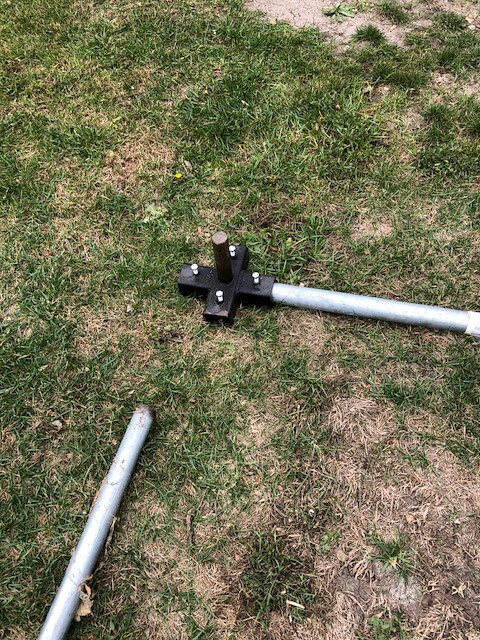 Just had a top rail coupler that I drilled 2 bolts through to secure it to each piece of top rail and had 3-4 feet of it or so in the ground in a guide pole. This year I am adding more weight to the tree and am looking for something stronger. I was thinking threaded pipe or something. Then just mounting a eye bolt pully at the top. Similar to a flagpole. Not sure if this is a realistic idea or not so I figured I would reach out to the community for suggestions. The tree will be approx 18 but no more than 20 feet tall so pvc is out of the question. It is on the side of the house where traffic is 14 feet away so it needs to be strong material and secured in concrete for stability. My concern with what I have now it was always flimsy and even with a guide pole in the ground secured with concrete, The top section of the top rail had too much wiggle. So I want to find something stronger. Just curious what you guys use for your mega trees. It needs to be something easy to put up in sections and that can hold wind. We are just off the cost in Florida and the wind gets pretty strong at times. 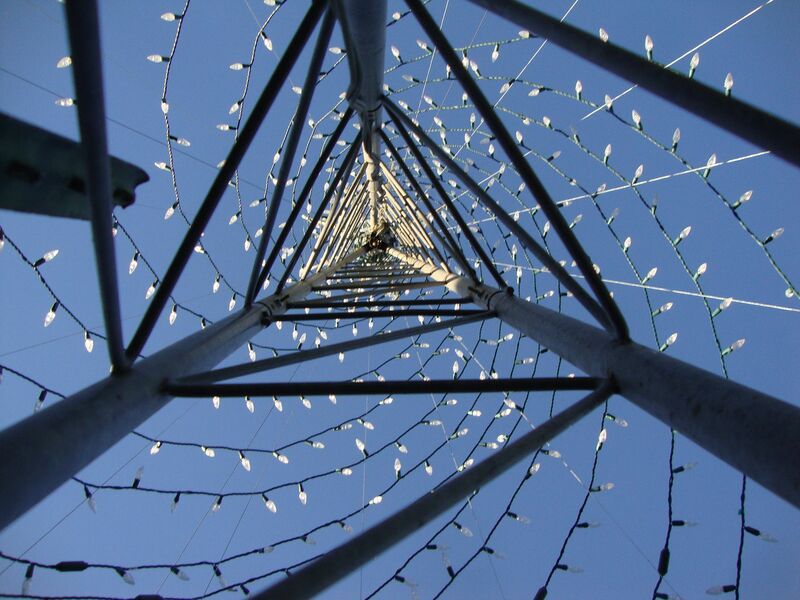 What do you use for your mega tree mast? 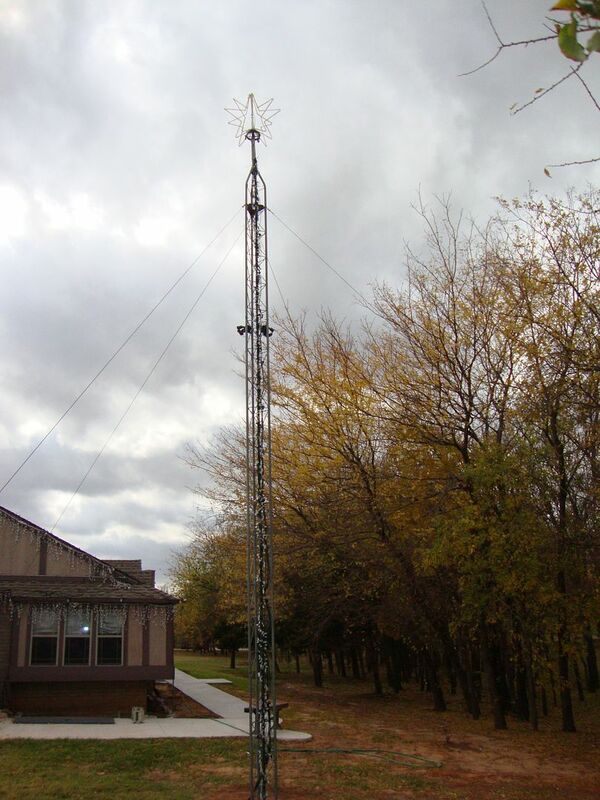 I use a Rohn25 radio/ham tower fro my 33' mega tree to hold my 20,000 lights. I use the same thing for my 16' spiral tree. 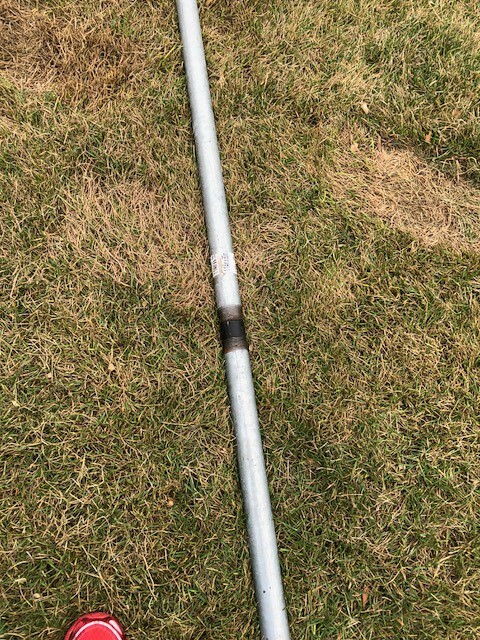 two sections (10ft) of galvanized pipe connected with a pole pin from Christmas light show. Also use there bases. 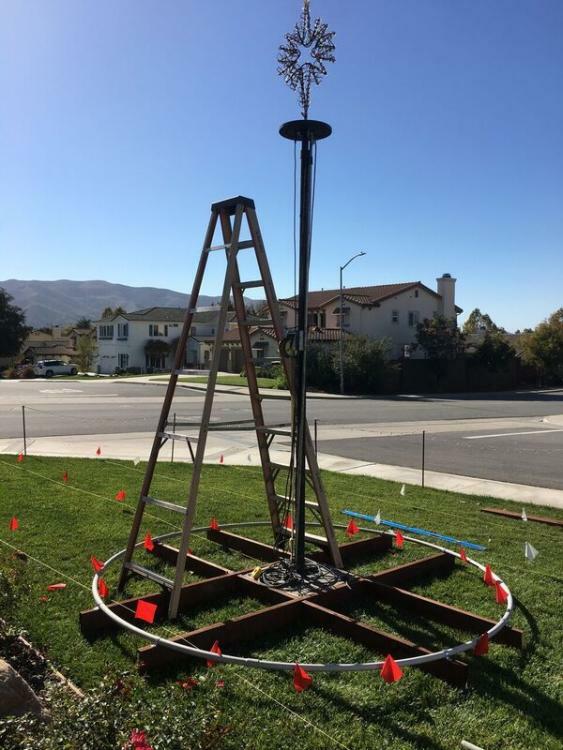 Same here - I use their pin pole (great solution) and then have 2.5' of PVC buried in the yard set in concrete. I am in FL so no risk of freezing. two sections (10ft) of galvanized pipe connected with a pole pin from Christmas light show. sandbag the base and no need of guide wires. 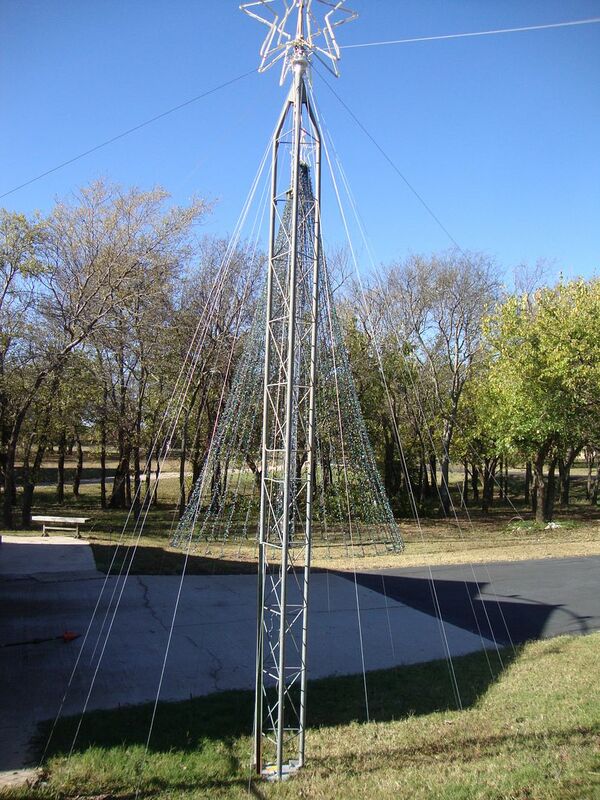 though I do envy Santa Helpers rig but did not have a used/unavailable radio tower to use. Same here in Florida as well.... although I think I only have inch and a half PVC in the ground going down three feet but concrete all the way around it until about 6 in below the grass level. Was just wondering if there's something to make it more secure as it kind of Bibles with the coupler they sell at Home Depot even with bolts in it. Yeah I was looking at the pole pin but I only saw 8in. they were out of stock on the 12 inch one. That was my next option. I'm just thinking the 12-inch would work better than the 8 inch. Yeah the stuff I got was galvanized fence top rail 1-1/4 but I didn't have the right connector. what I had is one of their joining couplings that they sell in the fence section and I just drilled holes through it to bolt it together. Even with the bolts it is very flimsy. I'm definitely needing some sort of pin that makes it more secure. The biggest problem I have is not having access to a lift to go up 20 feet to hook the wires so I have to rig the top with a pulley to make it like a flagpole per se 2 help the lights move/move up the pole to get to the top then tie it off. I bought the parts to do that today but I definitely need to find one of those pull pins. Does anybody else sell those online? if you are using galvanized pipe then the 8inch should work, if you buy it and aren't happy then I will take it off your hands. If you can find two 10' sections of Rohn tower, you can climb it like I do and not worry about a pulley system. And adding more lights will put more weight on the pulley rig. I used top rail for my 18' pixel tree, and it bent over in 20 mph wind. Bent right in half. I strongly suggest against it. Some frown upon the top rail - point understood. 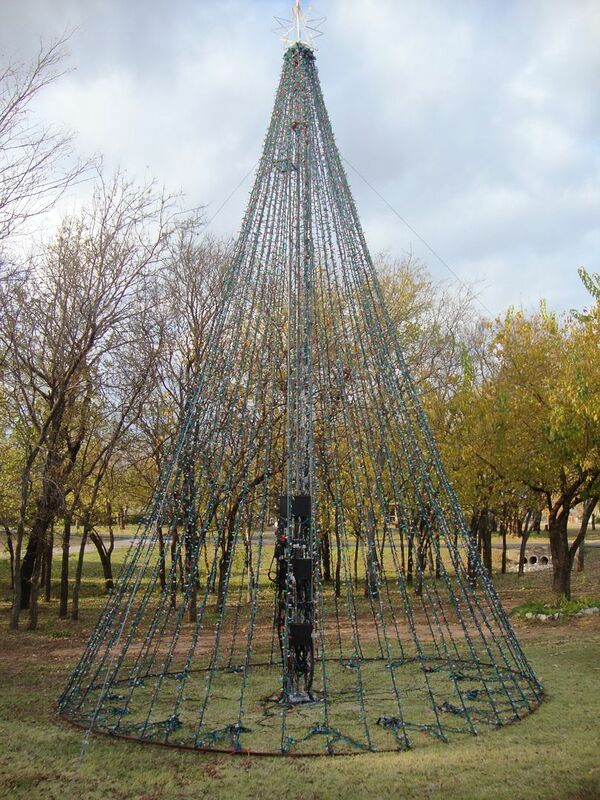 The top rail honestly hasn't been an issue for my project but then again I don't have 10,000+ lights on the tree LOL I only have 1600 and will triple that weight this year so I am looking into other options. It has been used for the last 3 years but that being said, I'm wanting to upgrade *from* the toprail to something better. For those that use the rigid black pipe what is the average price around you? I saw it at Home Depot here yesterday and it's $50 for 10 ft. To me that price just seems a little high but that seems like the best option over the toprail. Looking for an affordable alternative that isn't overpriced but it seems like everything else is twice the price. The pole pin looks like it would be a good support mechanism rather than just the threads on the rigid black pipe so I sent the company an email asking them when they will become in stock again as it shows 18 people are waiting to be notified for it when it gets back in stock. Haven't heard anything yet but hopefully after the weekend they'll respond to me. Now, to insure the joint was as strong as possible, again, used the pole-pin. Also I cut the threaded portions off. That takes the weaker spots out. Great idea. I didn't even think to check the rigid conduit while I was there. I will go price that at lowes today. Thank you for mentioning that. As a price point, 2 inch rigid electrical conduit is $50 for 10 feet at Home Depot. I had to buy a piece of that for a new service riser (upgraded from 100 to 200 amp service). I think I may have found the correct stuff at Lowe's today at a much better price than what Home Depot was. They had 1 in and a quarter 10 ft sections of galvanized pipe and also had the black iton pipe 10 foot sections for $29. Just wanted to run this by you all and see if this is what everyone was talking about it's really thick and really heavy. That's what we have always used, and never had any problems. We also have PVC buried 2.5ft deep and encased in concrete as a base. I already ordered and received one of the 12" pin poles. I ordered two so I have a backup but only one arrived so waiting on the other. Planned on getting the black iron pipe as well since it was only $29 for the 10-foot sections at Lowe's. Luckily the pole pins got put back in stock after an email to the company. So I'm going to have that ready next week so I can reconstruct my setup for it this year. One note on using the pin - sometimes it is hard to get it into the pipe as there is a weld line in the pipe. You may need to grind it out if it seems snug. I used a rounded metal file connected to a sawzall to clean mine up.